Michael Whiteacre: Sometimes I think I give off a scent or something, you know, rouses the female. Michael Whiteacre: Oh now wait a minute. You mean to tell me that you didn't--Oh your antenna's turned off. Noah Ackerman: No, I frankly didn't notice. Michael Whiteacre: Oh, you're sick. Michael Whiteacre: Have you ever had a girl? Noah Ackerman: Have I ever had a girl? Michael Whiteacre: That's what I thought! Q: In front of which building are Capt. Hardenberg and Lt. Diestl posing? 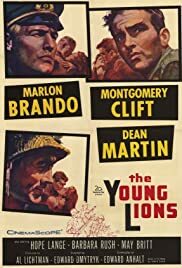 `The Young Lions' is the Second War II presented through the participation of three soldiers. Christian Diestl (Marlon Brando) is an idealistic German, son of a shoemaker. He joins the Army believing that life could improve in Germany under the administration of the Nazis. However, being a soldier, he cannot accept `acting like a police' in an occupied Paris and requests transference to the front, where he has another disappointment with the cruelty of the war. Noah Ackerman (Montgomery Clift) is a shy American Jew, a very simple man, just married with Hope Plowman (Hope Lange) and very discriminated in his platoon for being Jew. He goes to the war and leaves his family. Michael Whiteacre (Dean Martin) is a successful actor who became friend of Noah while in New York and is also obliged to join the army and go to London. There, he decides to leave the office activity and join his platoon in the front. This movie is excellent. It shows common people being used by government in a senseless war. All the main characters are peaceful common persons: Christian is a very simple person, wishing to climb socially in life in a Germany without opportunities and is misguided by the speech of Hitler and pretty soon he becomes aware how stupid war is. Noah is also a very simple person, a salesman from a department store, who indeed wishes to be with his family and join the Army just for obligation. And Michael is a selfish actor and bon vivant, without any sense of patriotism and who is not interest in anything but to have his life back. These characters are put together in a stupid war, having to kill persons to save their lives and to obey orders, which they do not agree. This movie is an excellent perspective of the stupidity of a war. My vote is eight.